Between their grown-up adaptations of Flowers in the Attic and Petals on the Wind and their upcoming biopic slate, which includes films about Whitney Houston and Aaliyah, Lifetime is re-establishing itself as the go-to channel for tactless entertainment. Sure, it’s not high art, but it is fun to watch with a few drinks and a carton of ice cream, and what else do you really need after a long week? Still, one of their upcoming films has the potential to take that absurdity and turn it into must-see TV: The Unauthorized Saved by the Bell Story. Based on multiple independently-conducted interviews – and not, thankfully, Dustin Diamond’s 2009 memoir – the film will chronicle all of Bayside’s dirtiest secrets, and promises to change the way you look at the classic teen comedy, if you’re one of the few who made it through Diamond’s press tour without being traumatized. Thus far, all that’s been revealed is the cast, who you can check out on BuzzFeed, but the network is keeping the lid on what kind of shocking secrets will make it into the film. Going by the rumors, speculation and secondhand gossip that have circulated over the years, though, we’d say the film has plenty of shocking revelations up its sleeve; the Saved by the Bell story has it all. If you believe even a fraction of what Diamond wrote in his memoir, everyone was hooking up with one another behind the scenes at Bayside. And we do mean everybody: all three girls are rumored to have slept with Mario Lopez and Mark-Paul Gosselaar, Tiffany-Amber Theissen slept with a few of the show’s memorable guest stars, and Diamond was apparently picking up girls left and right at Disneyland. What else would you expect to happen with a bunch of teenagers stuck together for hours on end? Despite the gang’s memorable refusal of drug use on the show, Diamond maintains that everyone was actually getting high off-camera. Apparently, Theissen’s dressing room was the place to hang out if you were interested in lighting up. The actor formerly known as Screech also alleged that Gosselaar was using steroids during his time on the show, which the latter had since denied. Whether it’s true or not, you can bet it’ll show up in the movie. Between the rumors of NBC paying hush money to a girl who accused Lopez of sexually assaulting her, Diamond’s revelation that he had a relationship with Linda Mancuso, the network’s Head of Children’s Programming, and the speculation that executives and producers were abusing their power over the stars of the show, there are more potential twists and turns in this story than all of V.C. Andrews’ novels put together. With this many teenagers in one place, there must have been plenty of drama. Though there haven’t been too many fights or feuds at Bayside, Diamond does maintain that he was picked on and left out of things by the rest of the cast. Maybe they were just trying to help him get into character? Saved by the Bell was on during the finest period in American fashion: the late ’80s and early ’90s. 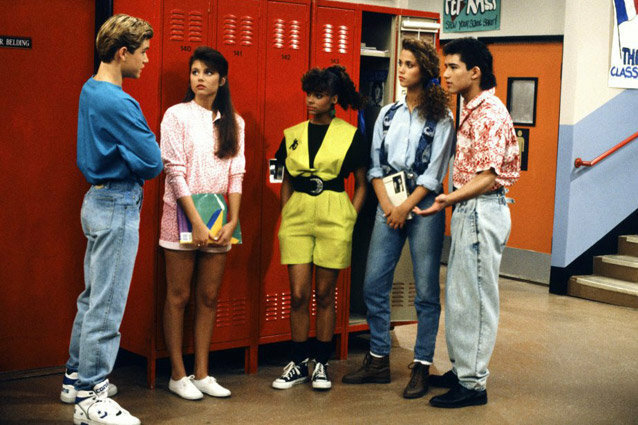 Since everything is more ridiculous in hindsight, expect plenty of acid-washed denim, teased hair, garish print and color combinations, crop tops and bows – and that was just Kelly’s wardrobe. We don’t even know how they’re going to tackle every ridiculous thing that Slater wore. The Unauthorized Saved By the Bell Story premieres on September 1 at 9pm on Lifetime. We’re so excited, we’re so scared!